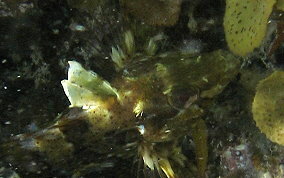 I've seen these fish most often darting in and out of Sargassum algae that grows on and around the rocky shorelines. 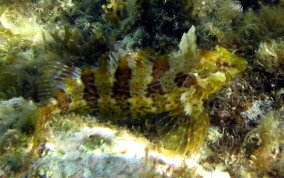 They are usually quick to make a hasty retreat and the female's yellowish color blends in so well with the yellowish color of the Sargassum that they are very hard to spot. They seem to like areas with wave action very much like the Night Sergeant does. Note: The Reef Set's picture and description is that of a Rosy Blenny, not a Barfin Blenny. It was a misprint.